Gates of the Arctic National Park is a complete 100% wilderness park with absolutely no trails, roads or facilities within its boundaries. Even the ranger stations are located in the nearby settlements outside the park limits. Rangers actually gather most of the information about the park from the returning visitors. The only way to get to the park is to get to Bettles, the largest of these surrounding settlements, and pay a bush pilot to drop you in a pre-determined location in the park. I should mention, however, that you do have an alternative mode of transport in winter, viz., a dog sled. Most summer visitors to the park either hike, climb, fish or float down one of the wild rivers of the region. Given our previous experience in hiking without a guide in Yosemite and Rockies we all had unanimously decided to take a float trip. Even allowing for the fact that none of us could swim or have any rafting skills, float was infinitely safer option compared to back country hiking for a simple reason that a river knows exactly how and where to go. It is harder to get lost when floating down a river! 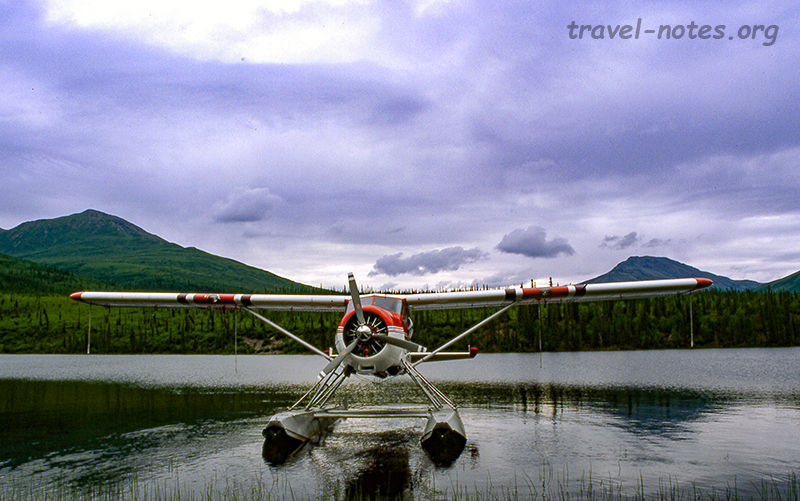 The day after we returned from Denali, we flew into Bettles for the first float trip of our lives. Bettles, situated just inside the arctic circle, is a small town of 63 people where the only road to the town becomes a marsh in summer. 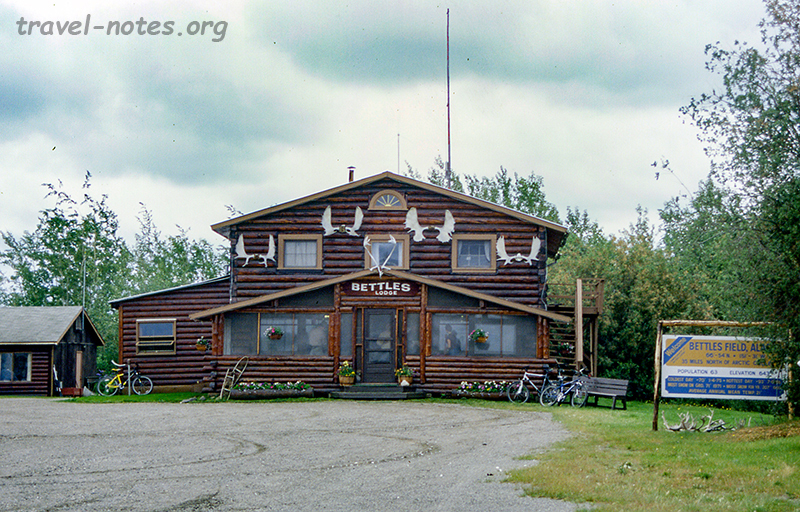 We made our entire travel arrangements through the Bettles Lodge, the biggest lodge in town, situated conveniently 20 yards from the only runway. 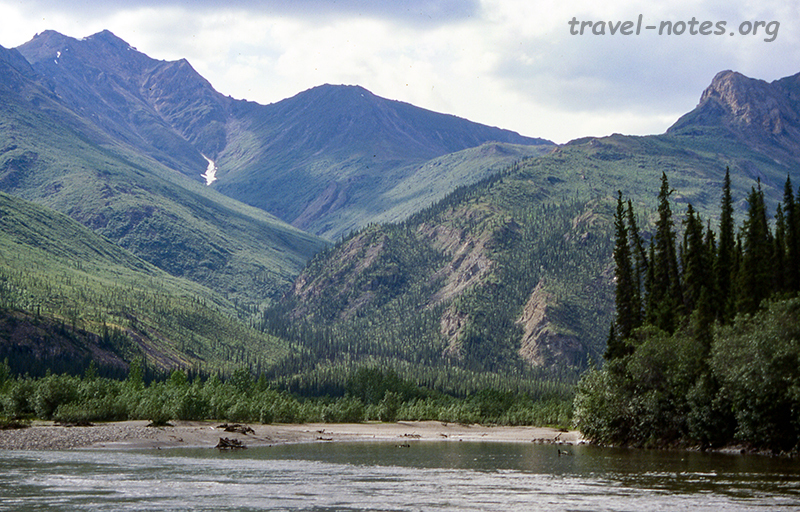 We had chosen to float down the North Fork of the Koyukuk river. Our decision was based on the facts that it flows close to the formation which gives the name to the park and that it flows right past Bettles and hence does warrant a pickup. We had to reconsider our decision as soon as we landed when we were told about the bad weather that had been haunting the place for the past week. Due to that, all the rivers were in full spate and given our background, we had no option but to choose the slightly milder one, the John river. Over the course of our trip we realised that the bad weather and its timing actually was the best thing to have happened to us in our lives. Firstly, rather than being backed up by 4 days like some others, the weather improved dramatically as soon as we arrived to ensure that we lost less than a day from our itinerary. 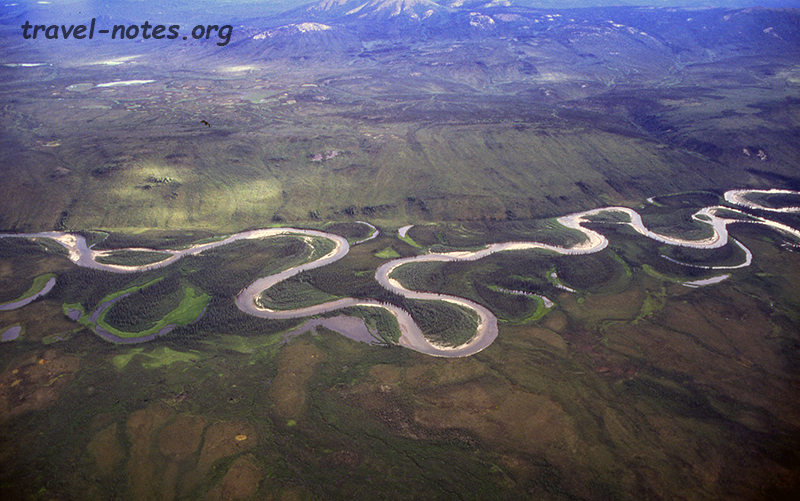 Secondly, we would have had to hike at least 4 miles from our drop off point to the river if we had chosen the North Fork of the Koyukuk. On the John, the hike was only 0.5 and with our raft weighing as much as a rhino, I am sure we would have lost couple of our oarsman well before the start if we had attempted the Koyukuk. Thirdly, John is the most scenic of the rivers. 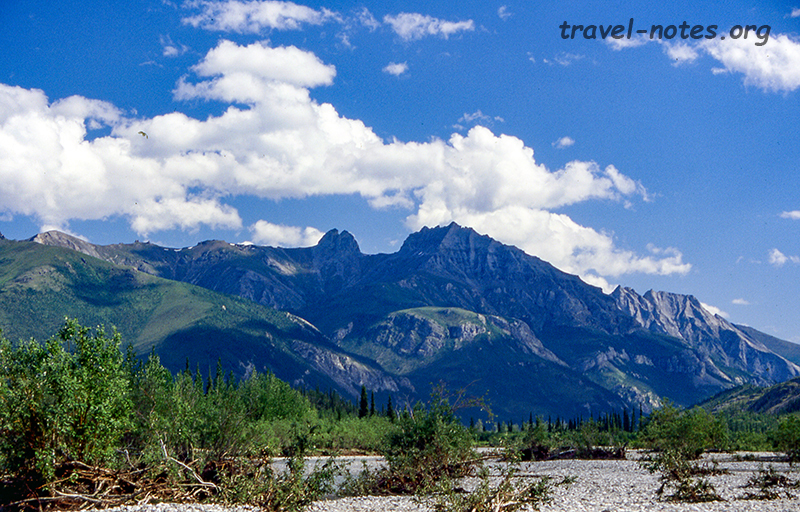 The river cuts right through the mountains and the scenery is quite spectacular from the river itself. On other rivers, we would have had to hike up to get to pretty views which with the boggy terrain is in fact much harder than it seems. Finally, Koyukuk is not exactly a beginners paradise. In fact, just a week before we arrived, two people were stranded on the river and had to be rescued by air. The two could easily have been four and the four could easily have been us! We were dropped early on the next day at the Hunt Fork lake for the start of our wilderness trip. We spent the better part of the day trying to climb a nearby ridge and the marshes soon confirmed that we would not be able to face the challenge of hike and float at the same time and we better concentrate on the more important one. We had our first fling with the oars later that evening when we tried to float down the Hunt Fork river and join the John river. Our inexperience showed when our motion tended to be more rotational than linear, when we spent more time pulling the raft out of shallow waters than rowing it and when after spending close to two hours we were still convinced that we were on the wrong river. But the funniest incident happened when an arctic gull (or that is what it looked like) started following us close to our raft. Within minutes we were reduced to hitting each other with the oars trying to shoo the bird! For the next couple of days we rowed quite a bit, about 8 hours each, knowing fully well that at that rate we would be finishing at least a day early. After the events of the first day, we all thought that we needed this buffer in case something goes wrong. Day two went off OK until little after midnight (or what should have been one; none of us knew what the sun was doing in the sky at this hour) when we were woken up by a drizzle. A five minute drizzle was enough to ruffle our feathers and convince us that the Biblical Flood has returned and we actually took turns to watch the water level! I think only the scarcity of animal life around us prevented us from catching two of each kind and stuffing them into an already over crowded raft. The biggest event on the day 3, quite contrary to the previous days, was our one hour intentional detour to meet a remarkable couple living in as close to middle of nowhere as you can get. Bill, the bush pilot from Pennsylvania and Lil, an Athabascan Indian, have been living in the middle of this wilderness for the last forty years. They have their private cabin, garden, greenhouse, watchdog, generator, satellite TV and aeroplane! It was quite remarkable to meet and talk to someone living where they were living and to drink real coffee in the middle of a wilderness trip. After a day and a half on the raft we finally reached Old Bettles, a ghost town and our destination. The lodge guys were keeping an eye on us during our last day and hence were able to pick us up on that day even though we were a day early. Although they picked us before promised, we still felt that we need not have been left waiting close to 8 hours at our destination. The float trip was certainly one of the more exotic things I have done in my life. For the first time I had spent a week in complete wilderness and for the first time I had wolves, bears and moose walk right past me when I am asleep! The extra day that we gained was spent on flight seeing two of the most visited parts of the park, the "Gates of the Arctic" and the Arrigetch PeaksTorres del Paines in Patagonia, Chile. It was definitely worth the effort and the varying degree of air-sickness that each of us suffered from during and after the trip. 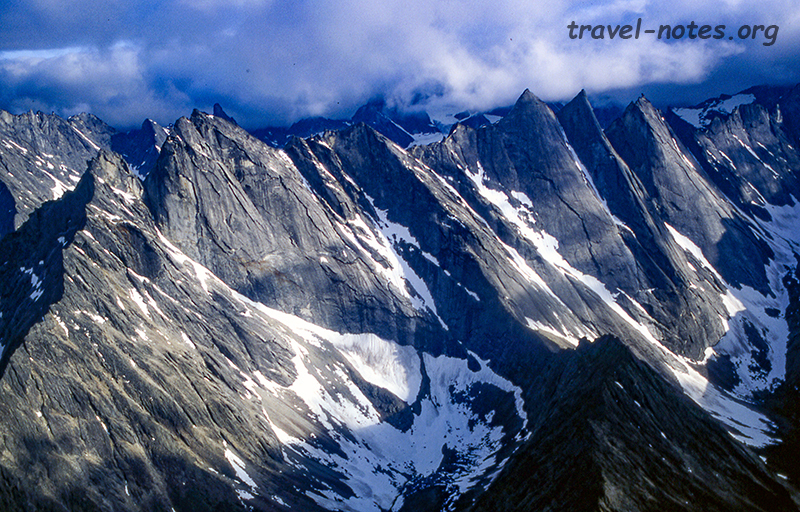 Click here for more photos from Gates of the Arctic National Park.